The Academy 'ohana waited on baited breath to learn the results of the National Presidential Award for Excellence in Mathematics and Science Teaching that High School Science teacher Erin Flynn was being considered for following being recognized on the Hawaii state level. After months of anticipation the results were released and the Academy would like to extend it's congratulations to Sacred Hearts Academy instructor Erin Flynn! Ms. Flynn was recently notified of her recognition on the national level for her outstanding classroom work during the 2013-2014 school year. 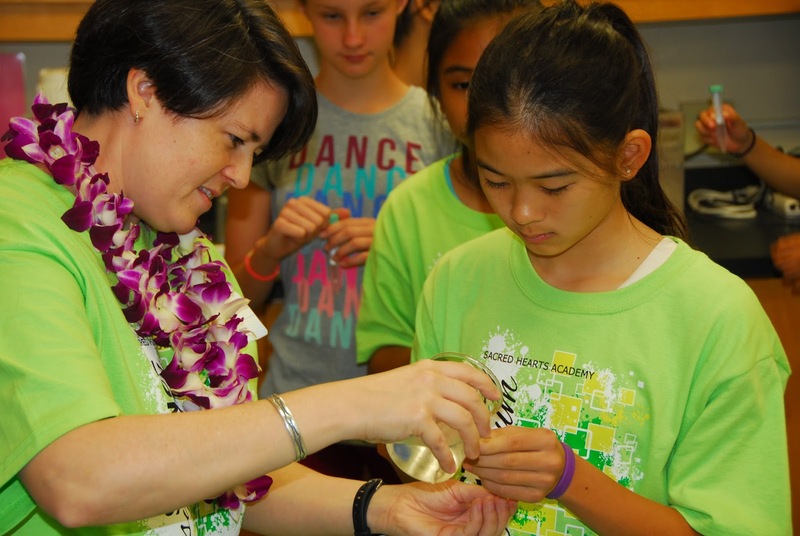 Ms. Flynn and 'Iolani School mathematics teacher Amy Yonashiro are among 108 educators nationwide who will receive an official citation signed by President Obama and a $10,000 award from the National Science Foundation as part of the honor. Each year the PAEMST program, which is administered by the National Science Foundation (NSF) on behalf of the White House Office of Science and Technology Policy, recognizes outstanding K-12 teachers for their contributions to the teaching and learning of mathematics and science for the previous school nationwide. The winners are selected by a panel of scientists, mathematicians and educators following an initial selection process done at the state level. Ms. Flynn was one of six finalists for Hawaii in the science category while Ms. Yonashiro was one of four finalists. The two will also have the opportunity to travel to Washington, DC, for an awards ceremony later this summer.